I was drawn along the path down the back-side of Asda, past the Beehive Pub. The pub sign depicted a smiling woman with a beehive (actual, not hairdo) on her head, reminiscent of a mythical being. Her visage was slightly unworldly and enigmatic. 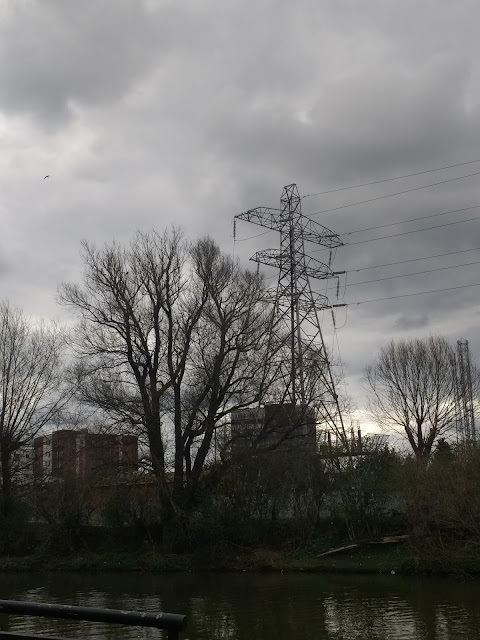 I reached the river soon after, emerging opposite the impressive green iron railway bridge and across the river from a terminal Pylon jutting out from behind the trees that only partially hid the patch inner city liminality beyond. An area usually devoid of activity other than the barely audible hum of the electricity sub station or the scuttling of a rat under a refuse bin, but currently operating as a temporary fairground. After observing the scene for a short while I decided to double back. As I did so, glancing down I noticed unusual 'footprints' set into the tarmac. One looked freakishly large, the others freakishly shaped. I imagined what sort of being might be responsible. A deformed Black Shuck maybe. Or some mysterious creature from across the river. A liminal beast rarely seen by human eyes. 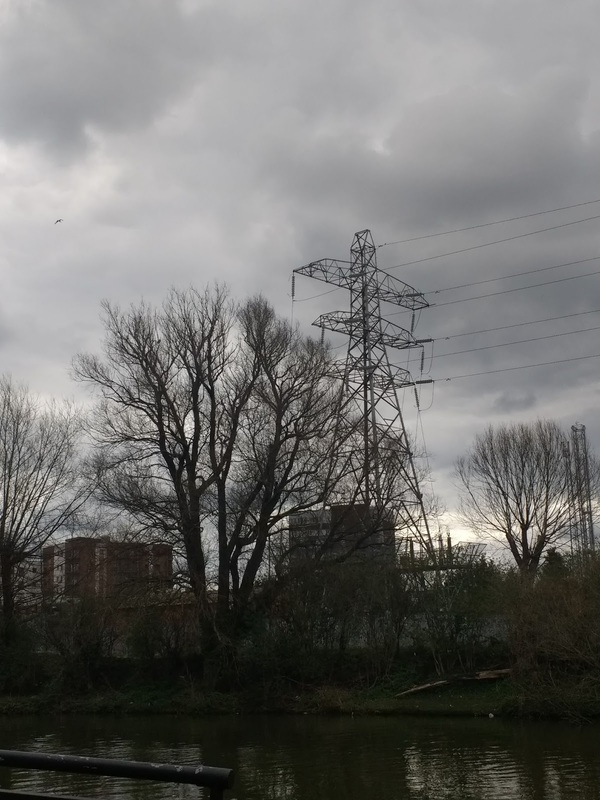 I left the scene and followed part of the depressingly named 'Workhouse' cycle route along a stretch between another back-side of Asda and some riverside flats. 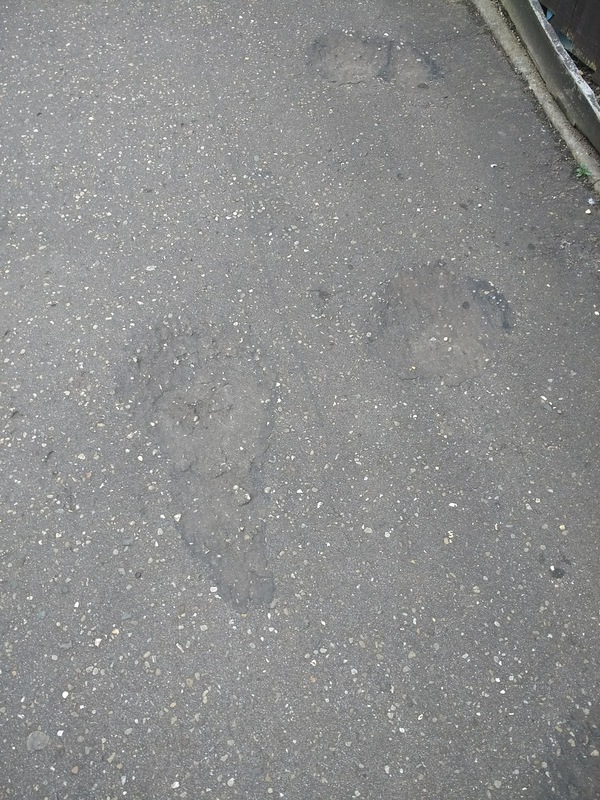 Following the encounter with Beehive Woman and the footprints of the Liminal Beast my walk had developed a different atmosphere and pace. Before I had been walking swiftly, thinking about lunch and getting back to work. Such trivialities had slipped away as if I'd shifted into a slightly different dimension. Things were slower, calmer and weirder. Emerging from Rivergate Arcade, I was drawn along Bridge Street and sucked into the main drag leading to the centre. Just beyond the pelican crossing, a man, probably in his 60s, hunched in a mobility scooter with a sound system attached on a trailer. Out of this pumped loud reggae. The man, sporting a policeman's cap, glasses and stubble, resembled a crumpled and more rough around the edges Blakey from On the Buses. As I passed, a jobsworth shop manager emerged from one of the retail outlets lining the street. 'Reggae Blakey' grudgingly turned down the volume, which was probably loud enough to be drowning out whatever 'musack' the shop was broadcasting inside in an attempt to soften the brains of potential customers. The shop manager was polite and non-agressive. But his rebuke of the man felt like an attack on eccentricity and the imposition of the bland at the expense of the interesting. As I continued next I passed two buskers, an older man and a girl who may have been his daughter, playing a sort of 60s American hippie folk sound. This complemented the already off-kilter atmosphere of my slow drift. Near the end of the stretch sitting among the anonymous faces of resting shoppers was a clown. Full make up, red curly wig, clown clothes. Slightly frayed at the edges: fag on the go, sad resigned face. Like redundant Ronald MacDonald. I'd seen him before. Always sitting and smoking. Never performing. I headed back to work leaving behind the realm of the Beehive Woman, The Liminal Beast, Reggae Blakey and The Clown. The Realm of the peripheral beings. The Walker of 'The Worst'.